I grew up in Brooklyn, New York and completed an undergraduate liberal arts degree at Princeton University. Given my love of animals from childhood, I then entered a pivotal Master’s Degree program in Animal Behavior and Conservation at Hunter College, City University of New York. This program introduced me to a broad range of research perspectives and afforded me a firm grounding in statistics. During my Master’s program, I had the opportunity to conduct research at the UBC Dairy Education and Research Centre in Agassiz. This experience gave rise to my Master’s thesis concerning cow-calf separation and helped solidify my career goals. Upon graduating in 2013, I entered Cornell University under a US Department of Agriculture grant to pursue a PhD in Animal Science, with minors in microbiology and epidemiology. My goal was to expand my hard-science training to facilitate an impactful animal welfare research career. I spent the final year of my PhD at Wageningen University in the Netherlands on a US Fulbright Scholarship, investigating MAP bacteria, the causal agent of Johne’s disease in ruminants. My dissertation features a mathematical model to facilitate the understanding of MAP infection dynamics on dairy farms. 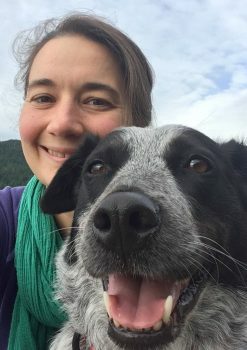 During my Postdoctoral Research Fellowship at UBC, I hope to integrate my interests in animal behavior, cognition, and epidemiology into research aimed at improving the quality of life for animals. 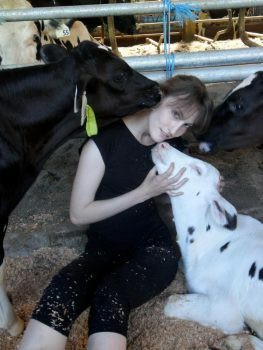 I grew up in Germany where I received my veterinary degree in 2008, and practiced as a dairy vet for 4 years. In 2013, I joined UBC’s Animal Welfare Program, first as an international student scholar, then as PhD student in 2014. During my PhD I investigated how healthy and sick dairy cows differ in a range of behaviors, completing my studies in early 2019. While I am still interested in animal behavior, my focus has shifted to WHY individual animals behave the way they behave, and how we can influence their behavior in the most kind and humane way. Farm animals need to frequently learn new behaviors due to our management systems, for example dairy cows need to learn how to go to the milking parlor, and farm animals of any species may need to be moved between different locations. Unfortunately, we often use the animals’ desire to avoid unpleasant, painful or frightening situations to achieve our management and training goals. In zoo and companion animals on the other hand, positive reinforcement training is now the gold standard, where we reward animals for correct behaviors; in other words, animals learn to use their behavior to get access to something pleasant, instead of learning how to avoid something unpleasant, and as result are often more motivated and safer to handle. I hope to see the application of positive reinforcement training increase on farms in the future, and am keen on researching how to make use of this training technique in an effective and kind way for animals and farmers alike. I grew up in a rural part of Germany close to the Dutch border before I went to veterinary school in Hannover. During a year of work and travel I fell in love with Canada and decided to go back after I graduated from vet school. 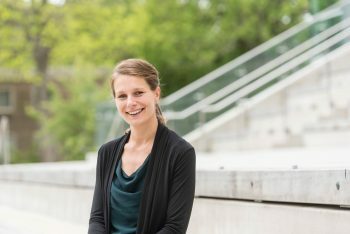 A PhD in veterinary epidemiology at the University of Calgary (Department Production Animal Health) was the perfect fit and provided the opportunity to combine my passion for animals with my interest in research. The focus of my PhD was to improve prevention and control of animal disease through a better understanding of the (social) influences behind farmers’ management decisions. I also became involved in the teaching of clinical communication skills to veterinary students and made veterinary communication another focus of my PhD research. The Banting postdoctoral fellowship allowed me to join the Animal Welfare Program in September 2018.